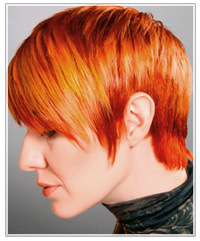 For color with a difference, give this two-tone red hair color a try! If you're a bit of a hair color fanatic then you're probably like me and always on the lookout for an exciting hair color that just makes you stop and go, wow... that's pretty cool. 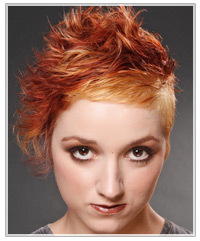 The color just put a whole new spin on how awesome red hair can look if you're willing to try something more interesting than just a flat, one tone hair color, and the combination of the deep red base color and copper highlights really takes the alternative short straight hairstyle to another level. 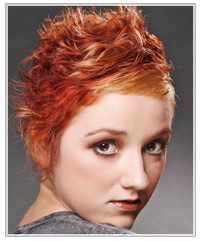 For a tamer version of the same hair color concept, this alternative short wavy hairstyle uses the darker red tone on top and the lighter copper red hair color underneath, and although I couldn't really see myself trying out the haircut, the color mix is very impressive and would work just as well in a mid-length haircut or something longer. If you'd like to see how you would look with these hairstyles then click on the images for a chance to try on the virtual hairstyle. 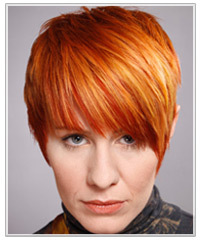 As for the hair color, is it something you'd try? Let us know by leaving a comment below!